I had a fun surprise a few weeks ago when I heard from a past student, Jaclyn Friedlander. She was a 4th grader in my class a while ago so I was thrilled to hear from her. It turns out that Jaclyn has written two books for children! So exciting as a teacher to remember a child writing in 4th grade and then continuing that passion into adulthood! Jaclyn was always an amazing person--filled with life and ready to change the world. I am excited to be back in touch with her after all of these years. Jaclyn has written 2 children's books in the Friends With Fins series (The Talent Show and The Fish Capturing Pirate) as a way to teach children about ocean conservation. She's also created an educational video and a book for the iPad. I love the story of how these books came to be and am excited to share Jaclyn's story with my new group of students this fall. I love to hear about the process writers use but even more interesting to me with Jaclyn's interview is the way she is using these books to teach kids about a global issue that she is passionate about. Her work is a great model for kids about how to use writing and media to make a difference in the world. There are lots of ways for our students to learn from Jaclyn. She has done several author visits and she is also available for classroom Skype visits. You can visit Jaclyn's website at friendswithfins.com and you can follow her on Twitter. Friends with Fins also has a Facebook page and you can follow Friends with Fins on Twitter (@friendswithfins). Franki: How did you get interested in writing for children? Franki: How did you get interested in ocean conservation? Jaclyn: I’ve always been interested in marine biology and if I hadn’t gone to school for acting, marine bio would have been my #2 choice. When I moved to Los Angeles, I called several aquariums looking for a place to volunteer. That was almost 4 years ago and now it’s something I’m HUGELY passionate about, and extremely educated in. I now not only volunteer for the aquarium, I also work with an organization called Heal the Bay as a member of their speakers bureau and as a beach captain for beach cleanup days. I could talk for hours about conservation issues, ocean animals and the many different species. Franki: Can you talk a bit about your writing process? You have 2 books in the series. What process did you use to get those to publication? Jaclyn: Someone said to me, if you want to be a writer, just write, so I did! I saw a need at the aquarium for a current video that taught conservation in a fun and exciting way for children, so I wrote and produced a video called Friend with Fins that is basically ‘Sponge Bob’ meets ‘Blues Clues’ and focuses heavily on West Coast conservation issues. It is now used at some aquariums and in classrooms as a teaching tool. It was so successful that once I finished that, I wrote a 22 minute pilot to try and have it turned into a children’s show and from there got the idea to write the books. Once the first book was written, finding an illustrator became a challenge but after that obstacle was out of the way it was smooth sailing. I decided to go the self-publishing route for several reasons. The first reason was because I didn’t want to risk the book never being seen. I have seen many extremely talented writer friends look for a literary agent for years and sit on really brilliant stories that never reach the public. Also, I wanted to stay on my own time schedule. I wasn’t interested in deadlines or having someone to answer to. I’m really glad I made the decision I did because after I found my illustrator and completed the first book, I put it out in paperback and Kindle form and then it was suggested to me that we make a version that is read along for the iPad, which I also did. Shortly after that, a teacher here in Los Angeles, Johanna Denise, reached out to me and offered to translate it into Spanish so that it could be enjoyed by both Spanish and English speaking children. Once it was out there, it took on a life of its own. I did some author visits at elementary schools and kids at every school were asking what the next Friends with Fins adventure was going to be, so I decided it was time to write the second book. Franki: Which character in your books do you most connect to and why? Jaclyn: I connect the most with the character of Amanda because in the stories she is a Marine Messenger who lives in an airtight dome helping sea creatures. She travels around with another Marine Messenger in their submarine and they send conservation message back to the surface. That’s something I wish could be real! I would LOVE to spend time exploring the ocean and I wish there was more that I could do to make a difference. Franki: Can you tell us a little bit about the illustrator of your book and how he came to illustrate your books? Jaclyn: My illustrator, Christian Hahn, is an extremely talented 14-year-old artist. He is my husband’s cousin and it’s actually a funny story how I decided to use him. I had been meeting with adult illustrators in Los Angeles and wasn’t finding what I was looking for. Many of them were very talented but their art was much more mature and realistic than what I was looking for. I wanted something that had a youthfulness to it and that I thought children would connect with. When I was talking with some of the family about my artist search, he overheard, went to his room to show me some of his sketches and drawings. I asked him if he would illustrate my book and he had several rough drafts for me before I even left that evening! When I’ve done author visits in the past, Christian has been able to come to a few of them, which is a valuable experience for both him and the students. The students can see someone just a few years older than themselves published and accomplishing his goal of being an artist and he has learned public speaking and is being recognized for his talent. Franki: What do you talk about when you do author visits? Jaclyn: When I visit schools my goal is to make learning about conservation fun! After reading the book and making it come to life for the students, I do an interactive presentation that educates and entertains simultaneously. A highlight of the presentation is four different varieties of sharks’ teeth to show similarities and differences between species, which is always a crowd pleaser. I also utilize the Friends with Fins video and answer questions about green screen, animation, acting, production and goal setting. Franki: How do you hope that your books will impact children? Jaclyn: I would love for children to get into good conservation habits and perhaps even teach their parents. Using cloth grocery bags, cutting apart six pack soda plastic rings, and not using balloons (or at least disposing of them properly) are just a few of the nuggets I try to teach kids. I also want these books to entertain and show children some of the many interesting animal species that live in in the ocean. Franki: Your books have some online features and iPad apps. Can you talk about the process for creating the iPad version? Jaclyn: I am lucky to have amazing technical support at home in my husband, Timothy Riese! He helps me with all of the formatting for the electronic versions. The fun part was getting some of my actor friends together to record the voices of the characters for the iPad version. Franki: You were a big reader and writer when you were younger. Are there any books from your childhood that you remember loving? Jaclyn: I have always loved children’s literature and to this day prefer young adult novels to regular adult fiction. I loved being read to by parents and teachers. My favorite books were The True Confessions of Charlotte Doyle, A Wrinkle in Time and then series like Boxcar Children, Nancy Drew, and the Bobbsey Twins. My favorite picture books were Chicka Chicka Boom Boom, DownBy the Bay and Gloria Houston’s But No Candy. Franki: Was there any work that impacted your writing of Friends with Fins-any authors you learned from? Jaclyn: When I was in elementary school we watched videos called “The Voyage of the Mimi” that taught history and then had companion workbooks and reading material. That was a huge inspiration for me and that was the original idea behind the Friends with Fins video. I would still like to see it go in that direction as a series of teaching tools that cross several media platforms. I was also really inspired by authors who came to visit our school when I was a child likeMem Fox and Tomie Depaola. Franki: Will there be another book in this series coming soon? What are your plans for the series? 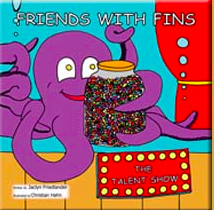 Jaclyn: Several kids have requested that I write a young reader chapter book of Friends with Fins. I’m not sure if that’s going to happen or not, but I’m definitely thinking about it. I would like to put out at least one more Friends with Fins picture book and I’m talking with production companies about turning the books into a children’s series, so fingers crossed! How cool!!! Love this story and interview.